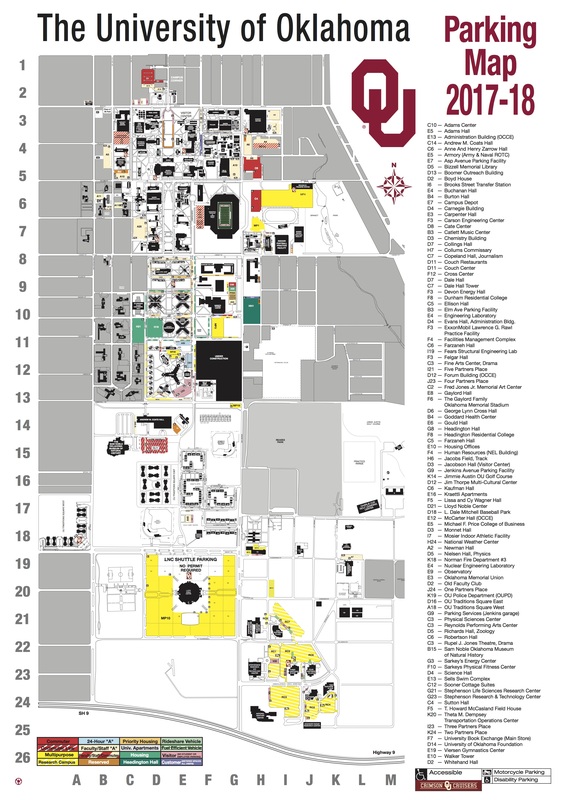 For those who purchased a parking pass with your registration, please view the OU parking map. The workshop will be held on the Research Campus which is located in the lower right hand corner of the map. The parking area for the Research Campus is designated with the yellow and white stripes. The workshop will be held on the 3rd floor of Four Partner's Place (room 3065), so the best places to find parking are in the RC1, RC5, RC6, RC3, RC2 or RC4 parking areas. All the RC areas are conveniently located to Four Partner's Place. You will receive your parking pass when you check in on Monday morning and should immediately go and hang it on the interior rear view mirror of your vehicle. You can rent a car from Will Rogers World Airport. Call (888) 851-7835 or visit http://www.airportexpressokc.com/ to make a 24-hour advanced reservation. As for transportation around campus and the city of Norman, OK, we have a great CART system. To visit their website, please visit http://www.ou.edu/cart.